There has always been some confusion when it comes to Cleveland block identification. 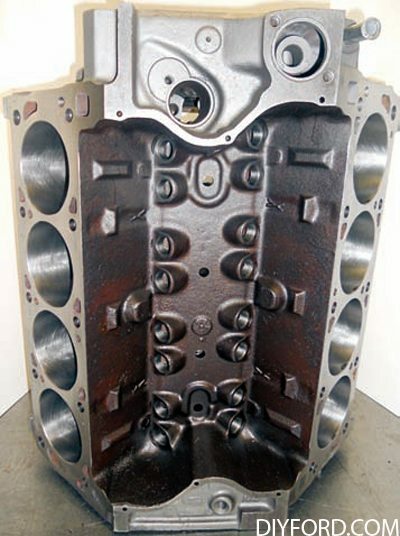 The 351C block castings, despite different casting numbers, are all basically the same casting and can all be converted to four-bolt main caps with help from a qualified machine shop. All have the same main webs and pan rails. And if you take away the casting numbers and date codes, these blocks tend to defy detection except for minor casting changes. 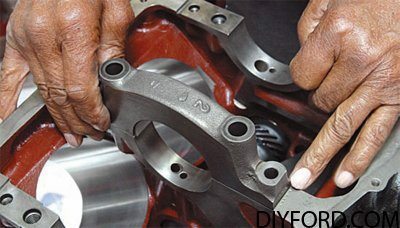 Any Cleveland two-bolt main block can be converted to a fourbolt main if you have the stock iron or aftermarket steel billet caps. Ford’s objective with the 335 block was strength with thicker decks and main webs. 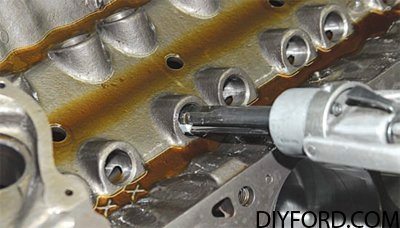 The oiling system, which gets a lot of criticism, was a cost issue more than anything to reduce the number of machining steps. For the street and weekend drag racing, the 335’s oiling system is adequate. 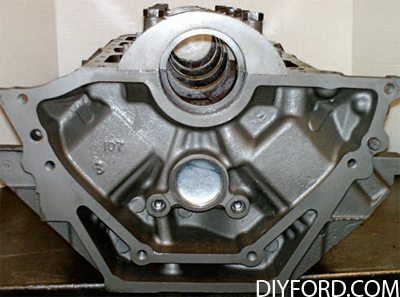 This is the four-bolt main 351C block with a D2AE-CA casting number. 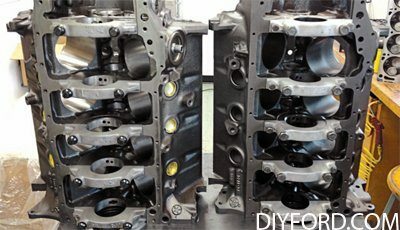 Thing is, not all D2AE-CA blocks have four-bolt main caps. Never believe what you see until the pan is pulled and the caps are inspected. Where Cleveland blocks and terminology get confusing is 351C versus 400 and 351M. Though the 400 is called the “400M” by a lot of people, it has never been called this by Ford Motor Company. The raised-deck 400 Cleveland, first introduced for model year 1971, was always known as the “400.” When Ford destroked the 400 to 351 ci and called it the 351M in 1975, people started calling the largest Cleveland the 400M. No matter how you look at the 400 or the 351M (for Modified or Midland), both use the same block casting that was in production from 1971 to 1982 though there are different part numbers. The “M” designation was conceived to differentiate the 351C from the raised-deck 351M, which replaced the 351C in 1975. Here’s a 351C twobolt D0AE-L main block. However, D0AE-L doesn’t always mean a twobolt main block. 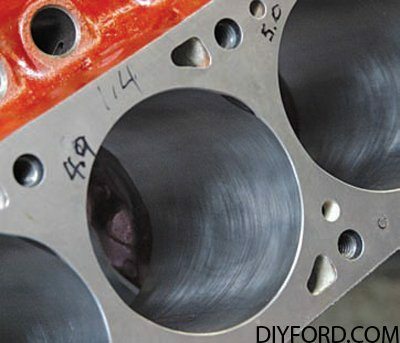 I’ve seen D0AE-L blocks with four-bolt maincaps out of Boss 351 Mustangs. I’ve also seen D2AE-CA blocks with twobolt main caps. 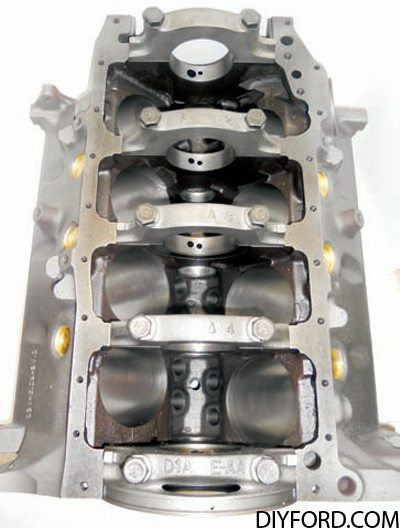 The 351C block is basically the same casting, drilled or not drilled for four-bolt main caps. 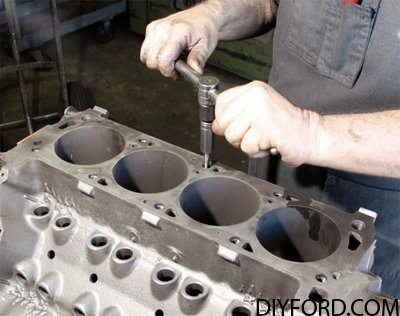 And, it is simple for a machine shop to make a four-bolt main block out of a two-bolt. When you’re building a 351C, 351M, or 400, keep in mind these blocks differ significantly from other Ford V-8s of the era including this Cleveland-specific 12 and 6 o’clock fuel pump configuration. 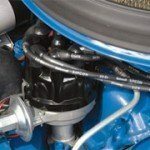 The Cleveland was engineered to have fewer leak points and improved gasket technology. 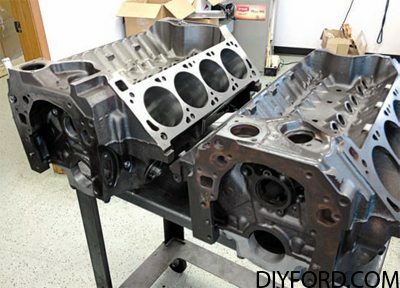 This 351C block at MCE Engines being built for Mustang Monthly magazine has been decked and honed. Aside from customary honing, MCE Engines puts on a nice fine finish hone for good ring seating. 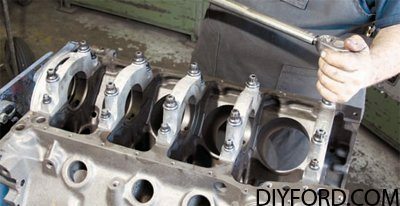 Block deck should be sonic checked and checked for warpage before any milling is performed. And when you mill, mill only the bare minimum necessary. This brass bypass orifice plug (D0AZ- 8K217-A) must never be removed and is exclusive to the 351C engine family. 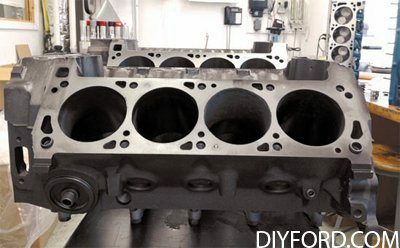 It can be removed for block cleaning, but must always be replaced. You can find reproductions of this orifice plug on eBay. 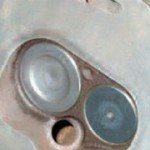 The 351C block is very similar to the Oldsmobile block with a steel timing cover plate and 12/6 o’clock fuel pump. The goal was to have fewer potential leak points. 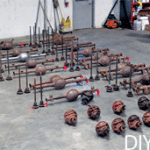 The Cleveland’s lubrication system preparation is something to consider during block prep. The 289/302/351W oiling system has three main oil galleys, whereas the 351C has two. 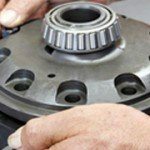 There are two lifter galleys that feed cam bearings. The righthand galley also feeds main and rod bearings. 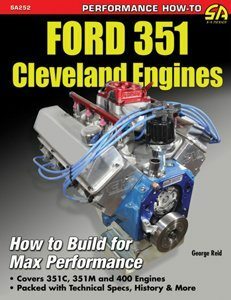 The savvy Cleveland builder knows how to get around oiling system shortcomings (see Chapter 6 for more detail). Foundry identification comes from this “CF” logo, which stands for Cleveland Foundry. 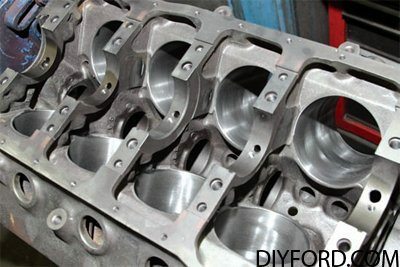 351C blocks cast in Australia have a “GF” for Geelong, Australia, foundry. When the 302C and 351C were introduced in Australia, North American blocks from the Cleveland foundry were shipped to Geelong for assembly. 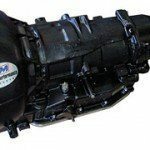 The 351C block casting number and date code are located just above the starter. 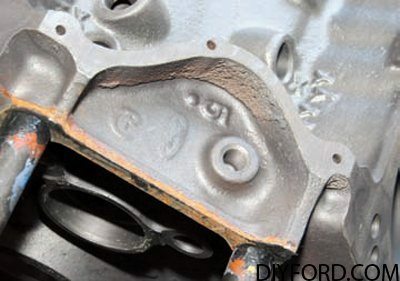 This D2AE CA casting number indicates a four-bolt main block according to the Ford Master Parts Catalog, but not all are. 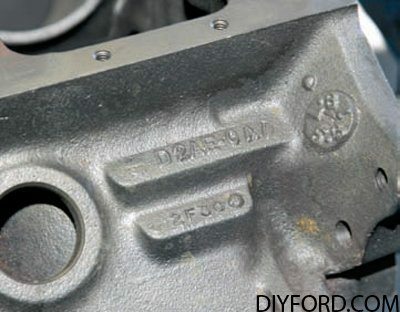 This casting date code “2F30” means February 30, 1972. 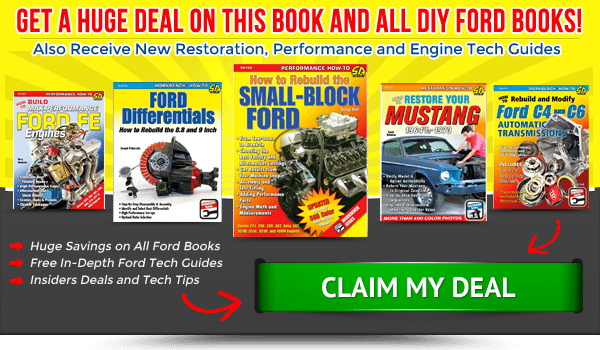 One thing that stumps Cleveland enthusiasts more than anything else are the nuances not explained in the Ford parts books. 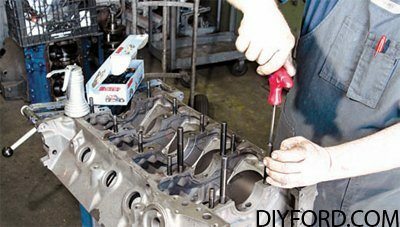 For example, did you know Ford produced 400 blocks in 1971 with small-block bellhousing bolt patterns and undrilled big-block bolt patterns (which can be drilled and tapped)? And did you also know Australian Cleveland blocks are different than their North American counterparts? 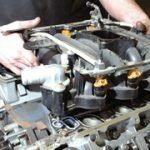 Though the Cleveland V-8 is as popular in Australia as the smallblock Chevy or 5.0L Ford is here, Ford never produced the 400 or 351M in Australia. The 302C and 351C were produced in Australia from 1972 to 1982. At least two things make the Australian Cleveland block different than its North American cousin. As a rule, Aussie Cleveland castings don’t have Ford North America casting numbers (as mentioned earlier), though it is believed some of the North American molds were shipped to Ford’s Geelong, Australia, foundry for those fi rst Aussie castings, which means there are some with North American Ford casting numbers cast in Australia. Another belief is Ford North America shipped discontinued Cleveland casting molds to Australia in 1974 when production ended here. 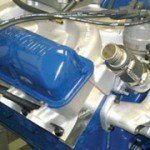 The terms “D” block and “square” block refer to the boss that rises from the left-hand block deck near the distributor above the fuel pump. D blocks have a D-shaped boss and square blocks have a male or female boss. Early 351C blocks have the D boss primarily, which may have been a provision for a water temperature sending unit on some earlyproduction blocks (but I haven’t seen enough of a production pattern to confirm this theory). 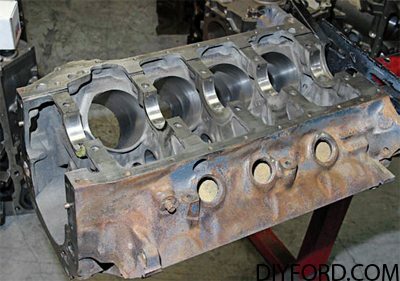 I’ve also learned Ford Australia never produced a four-bolt main Cleveland block though they’re as easy to convert as their US counterparts. 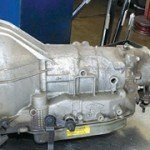 So, don’t be surprised if you find an Aussie Cleveland street block with four-bolt mains. 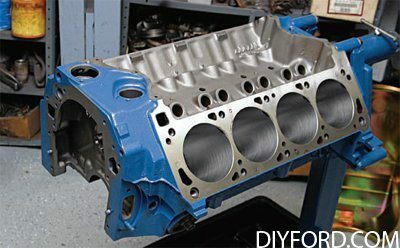 Another point to be mindful of is obscure block castings hidden away in race shops, garages, and barns. 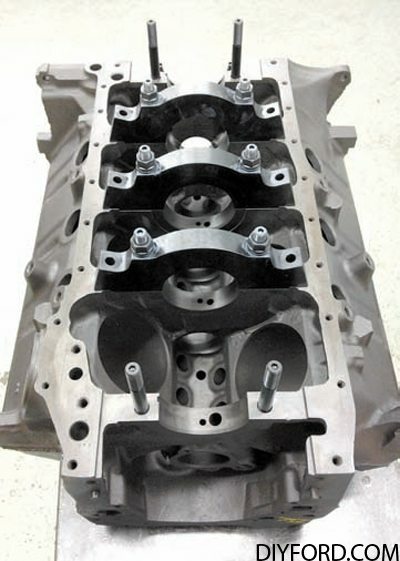 These rare blocks can be very limited production pieces to factory experimental “XE” and “SK” castings. I’ve seen factory aluminum Cleveland blocks, unusual iron blocks with heavier webbing and pan rails, you name it, most with the XE factory experimental casting identification. 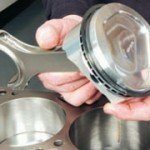 This is a four-bolt steel billet main caps on a 400 Cleveland. 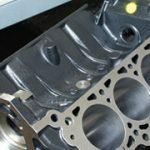 You don’t need took all over the place for a four-bolt main Cleveland block because conversion is quite simple in the hands of a competent machinist. I suggest you stud your main caps, even with stockers. It only improves security. 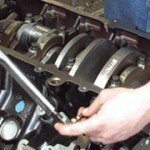 Four-bolt main conversions call for line boring and honing. Block prep should include thread chasing— and I mean every single bolthole. 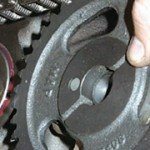 All bolt holes should be clean and free of burrs for accurate torque readings. There isn’t a consistent pattern of XE and SK numbers. These blocks followed convoluted paths all over the world from North America and Australia, leaving us with more questions than answers. 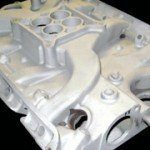 You may find these block castings at estate auctions, garage sales, eBay, Craigslist, classified ads, old dusty race shops, and other places. 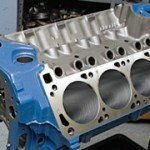 You find them completely machined and partially machined. Sometimes, you find raw castings. Expect to also see rough-cut Cleveland blocks with 3.990-inch unfinished bores. And, expect to see some that have never been hot with standard-size bores. 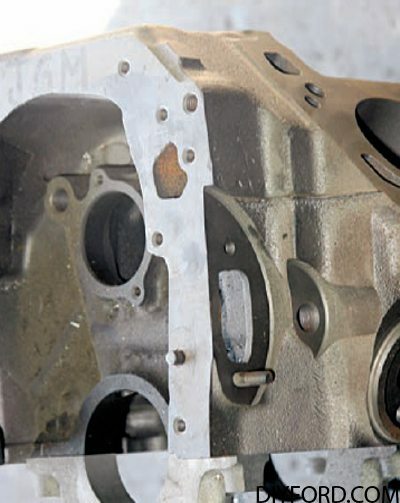 According to various sources online, some XE blocks found their way into regular production because they weren’t acceptable for racing (bad core shift and thin cylinder walls), but worked well in passenger vehicles. That makes your Cleveland block search a crapshoot because it is unknown what you will find out there. Another find known as the “pillow” blocks are race blocks that have bulges or “pillows” in the external block walls. 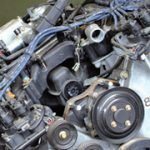 It has been often theorized in Internet forums that the Xs and Ys in the lifter valley of most Cleveland blocks means a higher nickel content, but Ford has never confirmed this. It’s like that old story of Mexican blocks being of higher nickel content than their US counterparts, which has never been proven beyond hearsay and bench racing. Mexican blocks and US blocks weigh within a pound of one another, which means there’s no difference in nickel content. It is believe the Xs and Ys were cast in to prevent cracking, a running production change in Cleveland blocks. Stud the mains for solid integrity, even if you’re building a stock Cleveland. Never run studs all the way down. Leave 1/4 inch between stud and bottom. 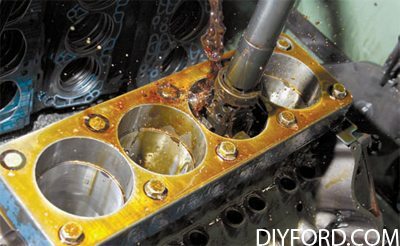 Use engine oil sparingly on stud threads; however, never fi ll the bolt hole with oil, which can crack the block. 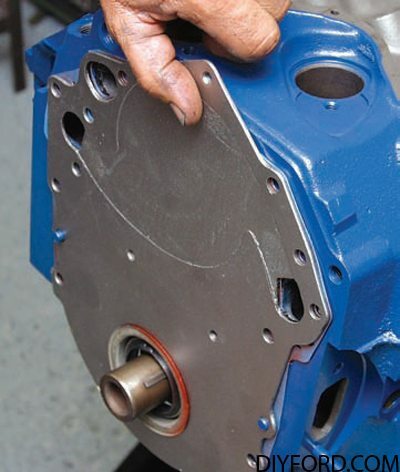 Before a 351C block can be line-honed, torque the main studs. 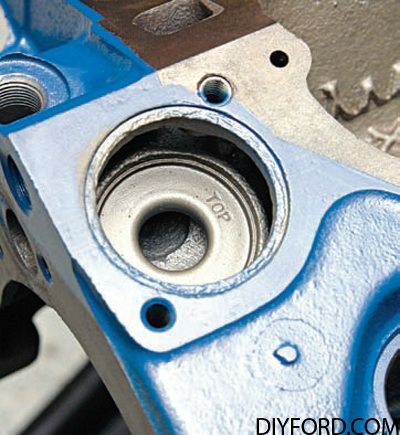 Apply moly coat to provide lubrication and an accurate torque reading. Torque mains from the inside outward in three stages. Again, do not bottom studs out. 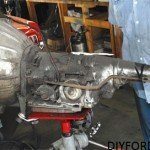 If you have converted a two-bolt main block to a four-bolt, the line bore must be line bored to size, then honed. 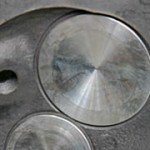 Check bores with a micrometer. Here is a 4.000-inch bore, which will be bored and honed to 4.030 inches. Never bore more than 4.040 inches, though some are willing to take it to 4.060 inches. 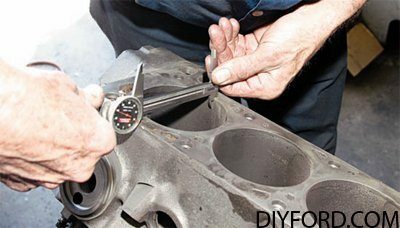 If you intend to go to 4.060 inches, sonic check cylinder walls before machine work begins. This Cleveland block has been bored to 4.025 inches. Honing takes it to 4.030 inches. Jim Grubbs of JGM Performance Engineering has his own honing process, which is based on how the engine will be used. Mike and hone lifter bores for proper fi tment and oil control. 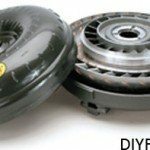 When tolerances become too sloppy, lifter bores should be sleeved and honed. Marvin seeks perfect main cap fit by dimpling the main saddles as shown. These dimples take up gaps providing a secure fi t. A snug fi t prevents cap movement at high RPM. Although I try to touch on just about everything you might find, there are going to be unusual, limited-production castings that surface breaking all the rules and posing new questions. 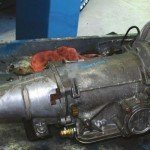 There has been factory Cleveland development documentation dating back to 1965 that tells us this engine was in development for a long time before it debuted late in 1969. 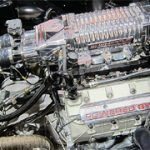 Factory race shops knew about the Cleveland long before it entered production making it Ford’s own mystery engine, not unlike the big-block Chevy. Early Cleveland blocks seem to have been plagued with cracking issues in the lifter valley. And when they cracked, coolant found its way into the oil. It appears the best Cleveland block to use is the D2AE-CA casting. 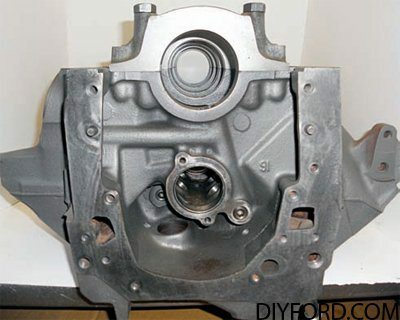 Though the Ford Master Parts Catalog indicates the D2AE-CA block is a four-bolt main casting, not all of them were drilled for four-bolt mains. 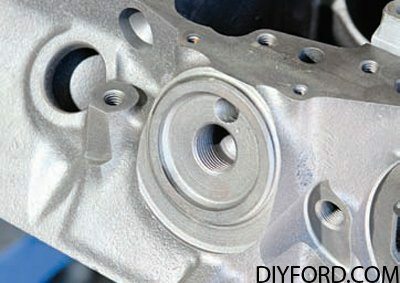 Always pull the pan to confirm before committing to a D2AE-CA block casting.